"We're in a really tight spot." "We're in a tight spot." Stanley Lombardo thinks it's a coincidence. If so, it's a wonderful one, with the translator's American idiom turning up in a movie that itself translates Homer's story into an American one. Rescue teams found Richard Kral drunk and staggering along a mountain path four days after his Audi car was buried in the Slovak Tatra mountains. He told them that after the avalanche, he had opened his car window and tried to dig his way out. But as he dug with his hands, he realised the snow would fill his car before he managed to break through. Hardly anyone in Higher Ed, Inc., cares about what is taught, because that is not our charge. We are not in the business of transmitting what E. D. Hirsch would call cultural literacy; nor are we in the business of teaching the difference between the right word and the almost right word, as Mark Twain might have thought important. We’re in the business of creating a total environment, delivering an experience, gaining satisfied customers, and applying the "smart" stamp when they head for the exits. The classroom reflects this. Our real business is being transacted elsewhere on campus. Sorry to tell you that I've been shopping with post-it notes on my wallet, and then on the shopping cart, and then dropped in the trash on the way out--for years. So I'm not the inventor of this shopping strategy (not that I really thought I was). But now I know how Homer Simpson felt when he discovered that Thomas Edison was the inventor of the six-legged chair. Teaching involves keeping track of countless smaller tasks--look up this word, check this quote in French, type this handout, make this assignment, write a letter of recommendation, get stuff xeroxed, check the library reserve list, come in at 4:15 for a meeting, add this link to the blog; many larger tasks--read the next ten chapters, make the final exam; and countless pieces of paper (for me, quizzes alone are 225 pieces of paper a week). Over the past few months I've been experimenting with different ways to stay organized. What got me started was reading about and then reading a book by David Allen, Getting Things Done. I've yet to really put GTD into practice (it's like the organizing equivalent of extreme sports). What I've come to realize though is that getting things done depends to a great degree on getting the right tools, the "right" tools being simply the ones that work best for you. Here are some helpful suggestions about finding tools that will work well for you. Consider a datebook. Paper is endlessly formattable--you can use different color inks, boxes, and underlining to keep track of things. If your stuff for a day is going to overflow the allotted space, you can use a Post-It note to accommodate the overflow. If you're sick of standard student planners and spiral bindings, you might want to look at The Daily Planner, a great source of datebooks and other stationery items. Datebooks from Exacompta, Letts, and Quo Vadis are especially well-designed (and not very expensive). Bookstores and office-supply stores are also good sources. Just buying a datebook that you really like can inspire you to stay more organized. If you have many meetings and appointments to keep track of, choose a datebook that breaks the day into hours. If not, choose something more flexible, with blank or ruled pages to write on. And choose something that you can easily carry with you. One more thing--use your datebook as a backup for phone numbers. (Many datebooks have pages for addresses in the back.) When a cell-phone goes on the blink and you can't get to your numbers, you'll be glad that you have a paper backup. Here's an alternative to the conventional datebook: Use a small notebook. I've recently become hooked on Moleskine ("moleskin") notebooks. It's really pronounced "mohl a skeen a," but if you ask for them by that name, you're liable to get funny looks. These are beautifully made notebooks, with oilcloth covers, acid-free paper, an expanding pocket in the back (great place to keep receipts, etc. ), a ribbon to mark your place, and an elastic band to keep the book closed. Moleskines come in various sizes, with ruled, squared, or blank pages. You can find Moleskines at Amazon, in Borders stores, and in art-supply and stationery stores. The hype for Moleskines is a bit much (the maker's claims that van Gogh and Hemingway used these very notebooks are somewhat fanciful), but the notebooks themselves are wonderful things. They're more flexible than datebooks, as you can divide up the pages in any way you like. I'm currently using a Moleskine to keep track of to-do items, a half-page per day. It almost goes without saying that this sort of notebook is ideal if you keep a journal. If you browse on-line, you'll find a whole world of happy people devoted to Moleskines. Look, for instance, at Moleskinerie, at Journalismo, or at this post from the blog 43 Folders. Reading such stuff makes me realize that no matter how nerdy I might think I am, I still have a long way to go. Here's an alternative to paper-based organizing: use a Palm. The great advantage of a Palm gadget over paper is depth. That little slab of metal and plastic holds a datebook that stretches for years into the past and future, an address book that can be organized into multiple categories of your design, to-do lists (also in multiple categories of your design), a notepad, and so on. There are countless add-on programs, many of them free, almost all of them tiny and almost instantly downloadable. And the Palm syncs its content with your computer, so you always have a backup. If you use Outlook, a Palm will sync with that, or you can use the Palm Desktop (which comes with the Palm). You can, of course, also work with Outlook or the Palm Desktop and sync its content to the Palm. To me a Palm is really a digital Swiss Army knife. I've used my Palm to write Microsoft Word documents, tune my guitar, store web pages and photos, store Adobe files, keep syllabi and course schedules, and keep track of books and records and movies to look for. The only real disadvantage of the Palm is that putting stuff in and taking stuff out is not as immediate as it is with paper. You know what I mean if you've ever seen someone "jot down" a phone number in a Palm--paper is a lot quicker. And you can't quite thumb through Palm pages in the way that you can thumb through pages in a datebook. But writing with a Palm stylus or the on-screen keyboard is not very difficult, and the tradeoff in speed might be far outweighed by the many ways in which a Palm can be useful. Finally, here are analog and digital tools together. Keep a few on the inside of a notebook cover, on the back pages of a datebook, and so on. You now have an always accessible way to mark pages, leave notes on doors, and so on. Use them for grocery shopping. Write your list on a Post-It and stick it on your wallet. When you get to the store, stick the Post-It to the handle of your shopping cart. When you're done, throw the Post-It in the trash. I first thought to manage a shopping list in this way a couple of weeks ago. It seems so obvious! But I've never seen anyone else do it (my wife assures me that, yes, I have invented this way of shopping). It's a great way to keep your hands free and not have to wonder what aisle you left your list in. Digital notes are also quite handy on your computer screen. There are several programs that create them; I like the free program ATnotes, which comes with a little desktop calendar too. You can use digital notes to keep track of things that are important to everyone in the house ("Return dvds by Thursday") and to make a running grocery list ("Buy salt"--because who remembers to buy salt?). You can also use digital notes to keep track of chores. Say that four people are taking turns with the dishes. Make a note with the days of the week in a vertical column and, next to it, another note with the dish-doers' names in a column (repeat the names several times). Now, if you move the note with the names up and down, you have a perpetual calendar and no question as to whose night it is to do dishes. As you may suspect, this system is in use en mi casa. So there are five simple tools. Except for the Palm, they can be had for relatively little money, and they might help a lot in your efforts to get and stay organized. Find what works best for you, keep your tools available, so that you can really use them, and get things done! Fewer than half the residents returned the survey. There are fewer good bookstores than there used to be. We used less than half the flour to make the bread. My guess is that signs for express checkout lanes--"less than 20 items"--have done a lot to foster the fewer/less mistake. Too bad that it wasn't possible to write "One Book draws overflow student crowd." That's a headline I'd like to see. Ezra Pound and T.S. Eliot, both interviewed by the poet Donald Hall. There is no Paris Review interview with H.D. (or if there is, it's not listed on the website). That's the formula a British researcher has used to determine that January 24 is the most depressing day of the year (at least in the British Isles). Here's an article to explain. I learned from Joe that the first thing to do when looking at a work of art was to do just that--look. Let your eyes take in what is in front of them. Look at a picture from different distances. Look away and then look back, but, since each picture suggests a visual starting point in it, choose a different point each time you look. At this stage, try not to have any thoughts about the work, such as where it fits in the artist's oeuvre or in art history or social history. You can do that later. If you allow such thoughts at this point, they will distance you from your seeing. And so Joe's comments at an exhibition would be of the "Look at that red" variety, when the very thing I had overlooked was the fact that red was the star--perhaps the raison d'être--of the picture. . . . For me Joe's visual perceptions were literally eye-opening. From Joe: A Memoir of Joe Brainard, by Ron Padgett (Coffee House Press, 2004). Joe Brainard, American painter, is also known as the author of I Remember. Ron Padgett, American poet, is the author of many books--poems, translations, and memoirs. He and Brainard met and became friends in high school, in Tulsa, Oklahoma. #1 COMEDY OF ALL TIME! Those were the words (all caps) on the cardboard displays filled with copies of Troy. Thanks to my son Ben, who has a fine eye for the incongruous and spotted this example in Walmart. 3703 students: The esteemed Paris Review is making all its interviews available on-line. You can find the PR interview with Robert Frost here, as a downloadable Adobe file. Many of the best-known Paris Review interviews are collected in the paperback series Writers at Work. To make all the interviews available, for free, is a gesture of tremendous good will and generosity. Thank you, Paris Review. The gesture to the mothers of France seemed to shake the sacred pillar of patriarchy. New Year's Day quietly ushered in a change in France's law on last names. It abolished the centuries-old obligation that parents give the patronymic, or name of the father, to their children. That means that a couple will now be able to give its newborn baby either the mother's last name, the father's last name or both names in the order the parents choose. A "societal disruption," another proof that fathers are being forced "to renounce one by one the attributes of what used to be called their familial power," complained an editorial in Le Figaro, the center-right daily. "This reform--we decree it silliness without a name," said a right-wing Roman Catholic newspaper, La Croix, in an editorial, calling the change a boon for genealogists, a nightmare for notaries. Names are serious indicators of status in a country like France. 3009 students: You (who are now reading a poem about Odysseus, son of Laertes, and Telelmachus, son of Odysseus) can read the whole article here. "It's a great class. You never have to open a book. All you have to do is show up." In the bank (overheard by a friend): "Tell the professor that I'm in Indianapolis and that the roads are really bad." 3703 students: If you have some time, look at "What If...," a page devoted to mapping out (with some hilarity) alternative paths in life. Another reason not to be called "Doctor"
Laura L. Callahan was very proud of her Ph.D. When she received it a few years ago, she promptly rewrote her official biography to highlight the academic accomplishment, referring to it not once or twice but nine times in a single-page summary of her career. And she never let her employees at the Labor Department, where she served as deputy chief information officer, forget it, even demanding that they call her "Doctor." From an article on diploma mills and the widespread problem of phony academic credentials among government employees. "Doctor" Callahan made it to the position of deputy chief information officer in the Department of Homeland Security before being forced to resign. Ruth Warrick (Emily, the first Mrs. Kane in Citizen Kane) and Virginia Mayo (Marie Derry in The Best Years of Our Lives) just died. The links are to the obituaries in the New York Times. 3009 students: You can find the text of an interview with Stanley Lombardo in this issue of Jacket, an on-line poetry magazine. Much of what's said might not click, but I think that anyone who's started reading Homer can pick up something from this interview. Students who've read the interview after reading Homer for a while have told me that they wish they had read it when they started reading Homer. Jacket, the home of this interview, is edited and published by John Tranter in Australia. 1. Hatred accompanied by contempt. 2. A state of infamy or disgrace. Here's a link to the most-requested materials at the Martin Luther King Jr. Papers Project at Stanford University. You'll find texts and audio clips (Acrobat, Quicktime, and Realmedia) of "Letter from Birmingham Jail," "I Have a Dream," King's Nobel Prize acceptance speech, "Beyond Vietnam," and "I've Been to the Mountaintop." This is open to all studetns and parents that are going to be attending in the fall and to those that have decided to further their education elsewhere. It's always good to avoid this alone--it's a weak word and often vague in its reference (and here I thank Jim Doyle, James P. Doyle, Dr. Doyle, who called me on this when I was a college freshman). Studetns is a reminder to always use a spellchecker. Though it can't substitute for proofreading, it'll at least find some typos. Who not that is appropriate for people. This evening is open to students who will be attending in the fall, students who have decided to further their education elsewhere, and all parents. 3703 students: You can read about the author of Making Your Own Days in this issue of Jacket, an on-line magazine of contemporary poetry (the on-line magazine, really). The piece by Charles North is probably the best place to start. Don't miss the link to "Popeye and William Blake Fight to the Death," a recording of a spontaneous collaboration between Koch and Allen Ginsberg (in front of a standing-room-only audience). Koch's quick wit in coming up with rhymes is almost scary. Koch's exuberance is evident even in his handwriting, as you can see here. Example: I will call you when dinner is ready. Capeesh? What they're actually saying is "coppish" (kuh-PEESH, also sometimes spelled "capeesh"), which is definitely not Welsh (too many vowels, just for starters). It's Italian-American slang for "understand." "Coppish" comes from the Italian word "capisce," based on the verb "capire," meaning "to understand," and can be used as either a question or an answer. 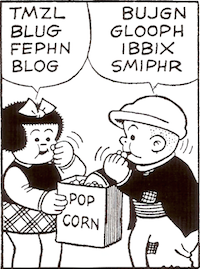 Like many dialect words born in immigrant communities, "coppish" affirms a bond between the speaker and listener. "Coppish?" thus often really means, "I know you understand, because you're one of us." And the reply "Coppish!" means "You bet, no problem, you can count on me." And if you want to read the most recent posts on Orange Crate Art, here's the front page. [Some further thoughts: I'm astonished by the amount of interest in this post--over 1,600 visits in the past two days. Then again, there really isn't anything very similar on-line--or if there is, I haven't found it--so if what I've written is useful, well, I'm happy. My one purpose in writing these guidelines was to help college students write to their professors with greater ease and maturity and a better sense of audience (instead of "i am a student in your class"). They're guidelines for writing to a professor, any professor, in the absence of other guidelines. And they're meant to keep a student in the high esteem of any professor to whom that student is writing. Why say "Hi/Hello Professor [Blank]?" Well, what should a student call a professor? Some people like "Doctor"; some don't. Some people don't have a doctorate. Some people don't explain any of that to students. There was a great piece in the Chronicle about this subject not long ago--"What Should We Call the Professor?" Professor, in the absence of any other guidelines, seems like a good choice. Why sign with your name, class, and meeting time? It's a courtesy, yes, but it also avoids the awkward "My name is . . . , and I am a student in your such-and-such class," all of which is taken care of in the signature. It occurs to me that "My name is . . . , and I am a student in . . ." is telling evidence of the unfamiliarity of e-mail as a way for students to communicate with professors. I appreciate the point several commenters have made about a follow-up thank-you being unneeded. Still, a lot of e-mail doesn't get through, and the follow-up, to my mind, closes the loop. Many people do a follow-up by using the subject line to say thanks, often followed by the abbreviation "eom" (end of message). That seemed to me too arcane to recommend. But I do like the idea of closing the loop by saying yes, I got it, thanks. I hope that this post leads to much more talking on the part of professors and students about communicating by e-mail. All reports from the business world point to enormous problems of clarity, correctness, and decorum with e-mail writing. Maybe things can start to go better in college. At Chicago's Wilbur Wright College, where the majority of students are immigrants, nonwhite, or both, Professor Bruce Gans runs a successful Great Books Curriculum, with an enrollment of about 900. Students in this program, compared with their schoolmates, greatly improve their writing skills, have far higher graduation rates, and are better prepared to transfer to four-year colleges. Meanwhile, Earl Shorris has developed the Clemente Course, a classical curriculum aimed specifically at people living in poverty. His first syllabus ranged from Plato's Republic, Aristotle's Nicomachean Ethics, and Thucydides' Peloponnesian War to William Blake and D. H. Lawrence. And yes, Plato is intensely relevant to former drug addicts. "Those of us in the grip of addiction use this process to rethink our lives," one student explains. "Socrates makes clear that you have to have the courage to examine yourself and to stand up for something. A lot of us have justified our weaknesses for too long a time." From an essay by Jonathan Rose, "The Classics in the Slums." For less drama, do all the chopping before beginning to cook. And preheat your oven to 400 degrees. 1. Cut the chicken into small pieces (larger than a caramel square, smaller than a ping-pong ball). The easiest way to do this work is with a cleaver (whack!) or a very sharp knife. Be careful! Watch the way people cut and chop on cooking shows--they keep their fingers curled under and in, not splayed out where the knife can get them. 2. Begin cooking the chicken in a large pan with a little olive oil, medium heat. 3. When the chicken begins to get a little brown, add some mushrooms (about half the package), chopped into small pieces, and let things cook a while. 4. Add the green pepper, chopped into small pieces, and let things cook a while. 5. Mix a packet of fajita seasoning with the necessary amount of water and add to the pan. 6. Let everything cook for a while. The vegetables and the water (duh!) will keep everything from overcooking and drying out. Your pan should be bubbling and steaming as the green pepper is pulverized. Is applesauce a traditional Mexican or Tex-Mex garnish? I have no idea. Two pounds of chicken should be enough for four large quesadillas (one package of tortillas), which will easily feed four or five people.